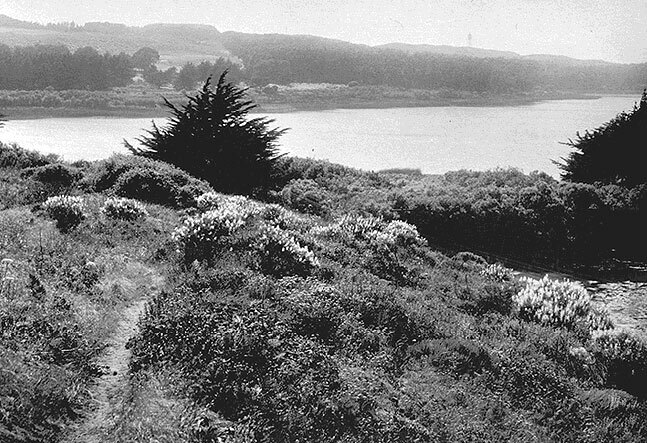 Wildflowers surround Lake Merced, 1920s. Famous among early botanists for its acres of wildflower fields, the grasslands to the south and east of Lake Merced have largely disappeared under the wilderness of asphalt. James Roof, a local botanist who loved to explore the area during his childhood, remembers the wildflowers being so abundant that after walking through the fields his pants would turn orange from all the pollen. The following account from 1902 evokes the scenic tramping trips that were so popular at the turn of century. Lillian E. Purdy wrote this account and shows her evident familiarity with the flora of San Francisco--and the popular 1897 guide to Wild Flowers of California by Mary Elizabeth Parsons, whose prose finds its way into several paragraphs here without attribution. The essay appeared in the Sunday supplement to the 13 April 1902 edition of the San Francisco Chronicle. And this bank, which is a vast field burst into the most gorgeous bloom, lies within the confines of San Francisco. To reach it is a matter of a car line, a moderate tramp and a little more than an hours time and exertion well spent, for when you have visited this glowing field of the most exquisite harmony of colors and most delicate perfumes, you will feel doubly repaid, and will agree with students of botany that there is nothing finer about the bay. Indeed, the flowers of San Mateo county, which have a great reputation, do not rank with these. Somehow the flowers farther south have paler color, smaller blossoms, and shorter stems than those of the San Francisco wild garden, and this peculiar perfection of the latter is undoubtedly due to climatic conditions. At any rate it is a choice spot in natures garden, for the flowers are ideal, the air balmy and the views superb. In all the forty-two square miles of San Francisco there are over 500 species of plants, which, botanically considered, is not a very large number. There would be a far greater number of species if it were not for the destruction of the native species incident to the cutting down of hills, the filling of swamps, the burying of streams, and general building of the city, and the lack of variety in climate and conditions. As the city is swept by ocean and not by eastern winds, the flora of the interior of the State is sparingly represented on the peninsula; and the variations in temperature being slight, the number is again diminished. There is little frost here, our summers cool and foggy, and the plants in consequence, while somewhat limited in number, bloom for a longer season, many of the perennials flowering all the year. Time was when you could gather wild flowers almost from your doorstep in San Francisco. Vacant lots and the nearest hills were alive with poppies (Eschscholzia californica) and buttercups (Ranunculus californicus) and lupines. But the city's growth has crowded these flowers from their haunts and you must now travel several miles of railroad and tramp over hills and fields before you can be repaid with a harvest of blossoms. And, when you know the way into this garden of glories, no walk will be too long, no fatigue too great to compensate for the feast of eye and soul that awaits you. The road into this natural garden of San Francisco, where nearly every species of our flora grows in reckless profusion, is found by taking the San Mateo cars, which carry you out through Sunnyside and on the border of the valley of vegetable gardens. Finally, at Ocean View, you leave the cars behind you and, walking southward along the railroad track for about half a mile, you cut across the field toward the ocean. From this point a most picturesque view spreads out before you. In the foreground is a variegated fieldpatches of gold, blue, rich, deep red and cream blended almost into rainbow effect--and beyond the green-carpeted hills, Lake Merced and a bit of ocean. When you have crossed into the very midst of this sea of flowers you find yourself surrounded by eschscholtzias (Eschscholzia californica), buttercups, wild pansies (Viola pedunculata), wild wallflowers (Erysimum franciscanum), baby-blue-eyes (Nemophila menziesii), mallow (Sidalcea malvaeflora), popcorn flowers (Plagiobothrys sp.) and numerous other varieties of California flora. The grass is fine, clean and beautiful, and, throwing yourself down to rest and enjoy, you feel that you are now in reality near to natures heart. All these beautiful living things throb with life, glow with color and exhale their fragrance to the breeze. It is an exhilaration and a delight. To me one of the most winsome of the flowers found in this field is the wild pansy or Johnny-jump-up. There is no other place in San Francisco where you will find a whole field sprinkled with its rich gold color. The red-brown and purple shades of the under side of its petals peep out as it nods and dances gracefully on its tall stem. If you look closely among its violet-leafed foliage (for it belongs to the violet family) you will discover small, tight, purple buds which will soon rear themselves to the sunlight and turn their golden faces upward. Besides admiring them for their own selves, there are practical advantages about these modest little flowers that further endear them to us. Their long, tender stems have a way of drinking up water greedily which makes them last longer than many other wild flowers, and renders them specially useful in table decoration. They look well in jars or in more slender receptacles, and scattered loosely on the table, nothing could be more pleasing, when yellow is the effect desired. Next to the pansy, in my preference, I would place the nempohila or baby-blue-eye. 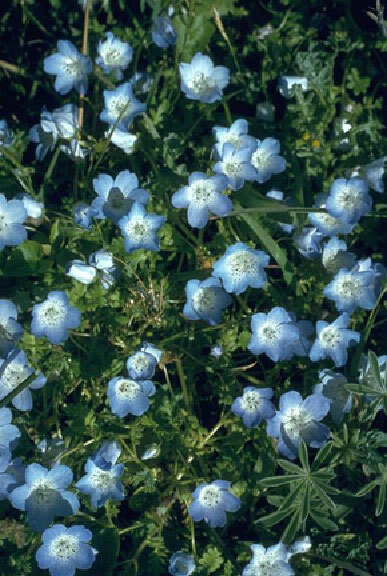 Although widespread in its distribution, the nemophila that grows on the flower-sprinkled slopes of Lake Merced is considered the finest in the State. Like bits of sky fallen to earth, their blue is deeper in this region, and the best ones that I have found would measure an inch across. Usually they are found upon the borders of moist woodlands, but here they have ventured far out into the open where there must be some peculiar climatic charm that nurtures them and their equally shy neighbors, the Johnny-jump-up. 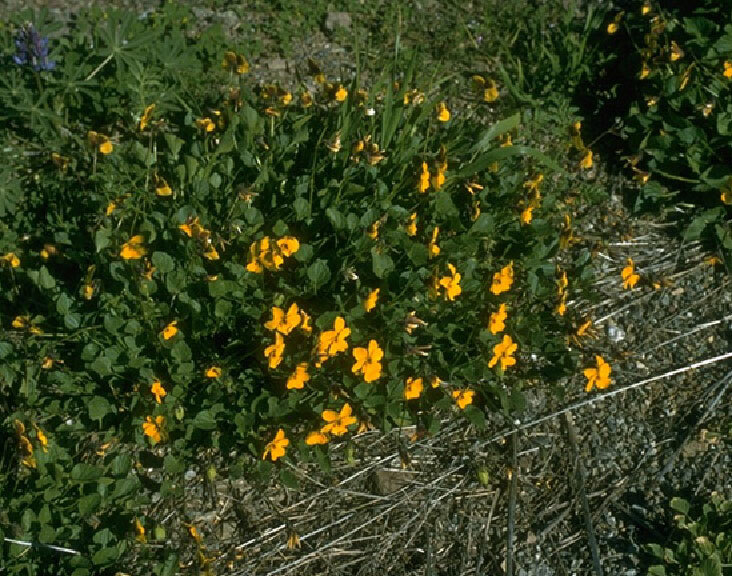 One of the most conspicuous flowers in this colored landscape is the wild wallflower of the mustard family. Its showy blossoms are of a deep cream color and grow from six to eighteen inches high. It is much more delicate than the garden species and stands out prominently in the field claiming peculiar attention to itself. It has a very delicate fragrance, and makes a bright bouquet when mingled with shepherds purse (Capsella bursa-pastoris). This latter flower is also a member of the mustard family and is one of the commonest and most harmless of weeds. It has a tiny white cruciferous flower, and shapely, flat, triangular pods, which have a peppery taste. The flower is so inconspicuous that it would hardly be observed or admired except by some one who happened to be looking for a plant to serve for foliage or a sort of garnishing for a more brilliant flower. The mustard family is indeed well represented in San Francisco, for there are two other varieties -- the rock-cress of arabis (Arabis blepharophylla) and the common yellow mustard (Hirschfeldia incana or Brassica rapa). The former has bright magenta-colored blooms, with foliage that grows close to the ground. The much-despised but pretty yellow mustard is everywhere, and nothing is more beautiful than its flowers in the mass, and the field of it on the Presidio hills beyond the golf links could not be surpassed for yellow beauty. There are no better buttercups to be found on the peninsula than those near Lake Merced. Their bright, varnished faces star all the meadows and hillsides, and if you desire the perfection of their golden beauty seek this wild garden of San Francisco, where they and pansies and nemophilas are at their very height. The poppies, too, reach their highest degree of perfection in this region.